I used FurMark 1.10.0 and ran the Preset:720 (1280×720 fullscreen). More scores can be found HERE. 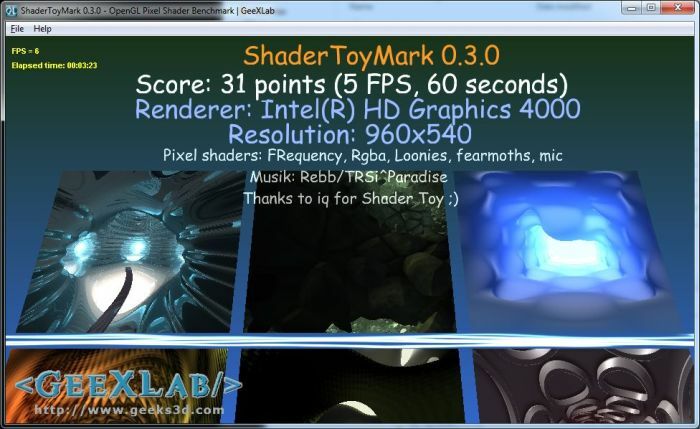 ShaderToyMark 0.3.0 is a 100% GLSL pixel shader benchmark. More information is available HERE. The procedural apple is a pixel shader test made with GeeXLab (OpenGL 2 / GLSL). More information about this test can be found HERE. Yes I know the comparison between the HD 4000 and the GTX 680 is not really fair. It’s just for fixing some numbers. I wonder how well Rage runs on this. My AMD APU can get 40-50 FPS in Rage. Intel said, the are still to deliver a properly optimized driver for IVB’s graphics unit, probably later this year. 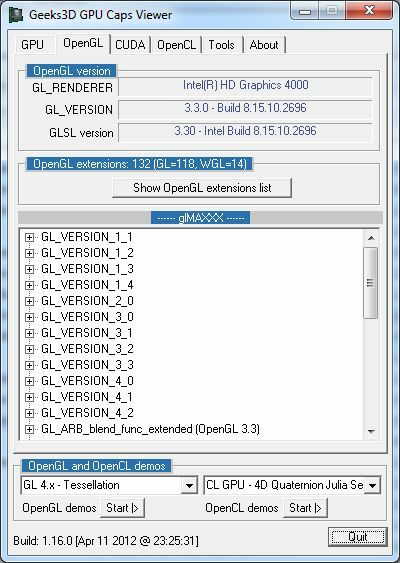 possibly lower the number of bodies..
@oscarbg the Bullet OpenCL gpu rigid body pipeline doesn’t work on Ivy Bridge yet, it only runs fine on latest Radeon and Fermi, Kepler gpus. I try to make it compatible, I just got the Ivy Bridge myself. @erwincoumans good to know you have IVB now and fixing it to work.. I am wondering how would one detect something bad happens with opencl. One of the tests above showed incorrect result without an error message. How would oen know running a computational task that it run fine? Any idea what motherboard was used in these tests?